Introducing the WPP ENERGY HHO MOBILE POWER STATION which is housed inside a sealed heavy duty 40 foot Container. This is a turnkey HHO power plant that will produce between 1MW and 5.8MW (estimate only, still under development) of electricity per hour as a stand alone independent solution requiring an input of a regular water line hook-up. The innovative technology converts water into HHO mixed with a safe environmental application to enough clean electricity to power a community of up to 150,000+ homes. The solution is scalable with more hardware added. The cost of power produced by the WPP MOBILE POWER STATION is a fraction of traditional power sources. It can be delivered to your doorstep anywhere in the world. The ease of transport by air, by rail, by sea, by truck or by heavy duty helicopter means that areas in the world that are not power serviced or that are under-serviced will have a viable and immediate power source. Depending on which configuration is ordered, the Power Plant produces between 1MW/h and 2.5MW/h. Other than a prepared flat surface pad the only thing needed to operate your HHO POWER STATION is a cold waterline connection. Operating cots of the HHO Power Station is a fraction of other power sources, 75% less than most other traditional power sources. When the HHO POWERSTATION CONTAINER arrives at the intended delivery destination it is ready from day 1 to produce power. No assembly of the internal power plant is needed. All systems go subject only to a water line connection being available. The container contains heavy duty construction including high tech fingerprint door locks. The power plant is fully contained inside to ensure no tampering by unauthorized personnel. The HHO Power Station is operating inside a fully insulted container which ensures noise is at a minimum. Should power requirements exceed the power capacity of a single container, more can be added and water and power lines can be interconnected. Cold, Hot, Humid climates are all equally well suited to use the HHO POWER STATION CONTAINER. It has a heavy duty construction, is insulated and the inside of the unit is climate controlled. The HHO POWER STATION CONTAINER comes with a heavy duty parabolic retractable power antenna which is wind rated for 100mph winds. Internet connectivity allows for power production data to be transmitted back to WPP servers for system performance monitoring by WPP. Wi-Fi will provide Internet access to users within range. 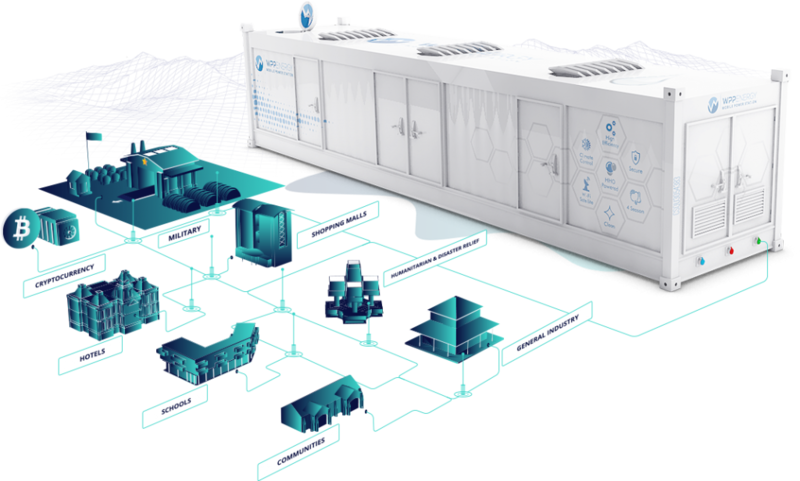 The WPP ENERGY MOBILE POWER STATION is an ideal power solution for the energy demands of many industries including an emerging consumption crisis from requirements of cryptocurrency miners. The 1 MW/h option will power up to 700 crypto mining machines and the 2.5 MW/h option will power up to 1750 machines. It is also ideal for military, hotels, shopping malls, schools, communities in need of an instant low cost clean energy power source and/or wishes to unplug from their current provider and form their own lowest cost power grid.